Lone Survivor Foundation has been selected as one of three charities participating in Rudy’s BBQ Camo Cup for A Cause campaign and we need YOUR help. We will up against the Chris Kyle Frog Foundation and the American Widow Project for the highest percentage of funds. 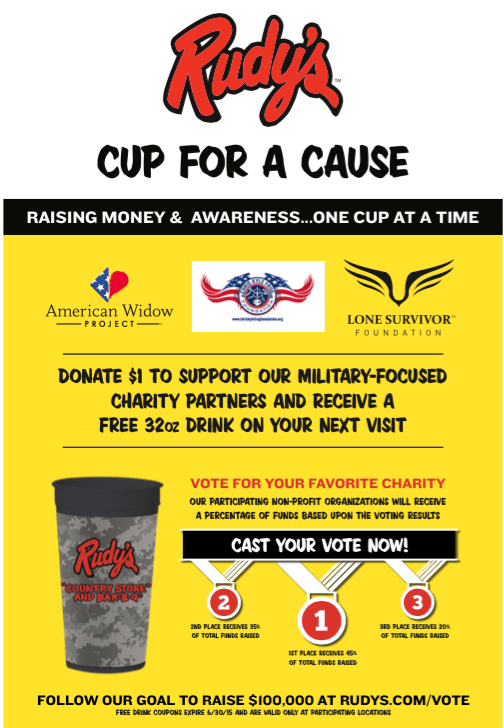 During the month of May we ask that you go check out your local Rudy’s BBQ, donate to the Camo Cup for A Cause campaign, and most importantly – VOTE on Rudy’s BBQ facebook page for Lone Survivor Foundation! You can vote once a day during the entire month of May. Encourage your friends and family to vote for LSF too! Eating at Rudy’s? Got a Rudy’s Camo Cup? Have a pic of you in LSF gear, eating at Rudy’s with a Rudy’s BBQ Camo Cup?? We want to see it! Use #RudysCamoCupLSF and #lonesurvivorfoundation when posting your pics to social media. Your pic may be chosen to be highlighted on Lone Survivor Foundation social media outlets! Rudy’s Bar-B-Q’s Camo Cup for A Cause Raises Funds for The Chris Kyle Frog Foundation, the Lone Survivor Foundation, and the American Widow Project in May! Houston, Texas, April 29, 2015 – For the third consecutive year this May, Rudy’s “Country Store” and Bar-B-Q is transforming their iconic plastic cups into camo colors to raise awareness and funds to benefit military charities. This year’s Rudy’s Camo Cup for A Cause beneficiaries are The Chris Kyle Frog Foundation, the Lone Survivor Foundation and the American Widow Project. The funds are raised through guest donations at participating Rudy’s Bar-B-Q locations. Guests who donate a dollar for the cause will receive a coupon for a free large drink that can be used on their visit. All the funds raised in May will be donated and divided by the three charities. To determine how donations are divided, Rudy’s guests are asked to vote for their favorite charity by visiting Rudy’s Bar-B-Q’s Facebook Page and clicking on the “Poll” tab. Facebook users can vote once a day every day until voting closes at midnight (Central Time) of May 31st. The charity with the most votes will receive 45% of the total amount raised while second and third place finishers will receive 35% and 20% respectively ensuring that each organization receives a significant financial contribution. Last year’s Rudy’s Camo Cup for A Cause raised over $90,000. Rudy’s Cup for A Cause fundraising program is held each May for military charities and October for breast cancer charities. The program raised a record amount of more than $140,000 last October and has donated more than $500,000 since its launch in October 2012, when Rudy’s Bar-B-Q changed its cups into color Pink for the first time. Since 1989, Rudy’s “Country Store” and Bar-B-Q has been serving up genuine Texas Bar-B-Q to folks in the Southwest USA. Rudy’s Bar-B-Q pits are 100% wood fired with oak. Along with time and oak, Rudy’s Bar-B-Q cooks with a dry spice that ensures perfectly smoked bar-b-q at every visit. It is best served with Rudy’s famous “Sause.” Rudy’s Bar-B-Q ships meat and sells its famous “Sause,” rubs and merchandise online at https://rudysbbq.com. Like Rudy’s Bar-B-Q on Facebook at https://facebook.com/rudysbbq and follow on Twitter at https://twitter.com/rudysbbq for the latest updates. next post: RumChata Freedom Bottle is BACK!